Microsoft Windows is the standard operating system of most home and business pc’s. After the most recent Windows 8 upgrade, many users were disappointed and opted to stay with Windows 7. But now Microsoft has annouced it will be releasing Windows 10, late 2015. The state it will be their “most comprehensive platform ,ever.” With a slew of changes and the reoccurence of the Start menu this will probably be a breath of fresh air (for the upset Windows 8 users). They look to direct focus on consumer and enterprise customers who rely on internet based applications. From the look of it, the workflow is similar to that of 7 but with a Windows 8 design touch. Windows 8 apps can now be windowed on the desktop. I actually prefer this over 8 just from the design aspect. And I’m hoping the structure and usage will play closely to 7. If you follow Microsoft’s pattern, every other OS release is usually better than the previous. So if they are following suit, this release will trump Windows Hate….I mean 8. 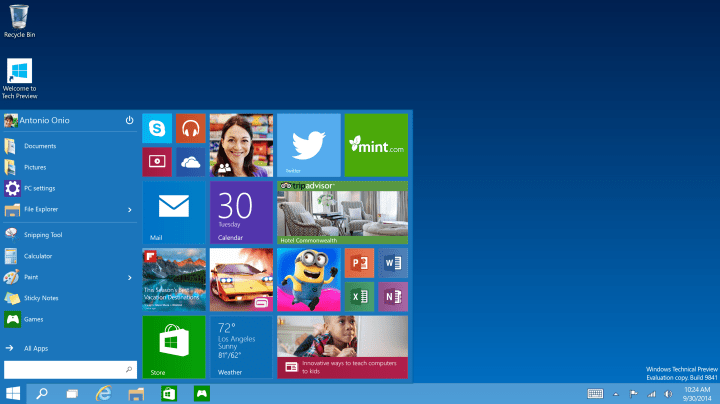 If you want to find out more, check out Microsoft’s blog: Microsoft Windows 10!